This month we’ve changed up the style of the graphs that we use for our ‘Are We There Yet?’ Meter, and altered them to focus only on the ‘low’ end of the price spectrum. 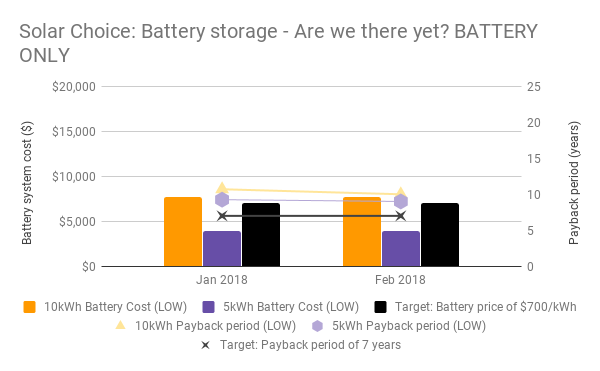 We’ve done this mainly for clarity’s sake but also because average payback periods for batteries are still very long for system priced in the ‘average’ range – even as average prices continue to fall. Average prices for ‘small’ (1-5kWh) battery banks this month sit at around $1,830 per kilowatt-hour (kWh) of storage capacity for a ‘whole battery system’ (i.e. inclusive of inverter), while prices for ‘battery only’ solutions for systems in the same size range are coming in at about $900/kWh. Larger battery systems cost less on a per unit basis. Important note: None of the prices & costs detailed below include the installation of a solar system. For current solar system prices, please visit our Current Solar System Prices page. The table below displays average, indicative battery installation prices from a range of installers around Australia, most of whom are active in the Solar Choice network. Prices include installation and GST. We do not yet have sufficient data to publish state-by-state or city-by-city figures, so the below should be viewed as a bellwether for battery prices nationally. Furthermore, all prices are based on a relatively small sample size (about ten different companies); we expect this number to grow – and the accuracy of this index to improve – as time goes on. 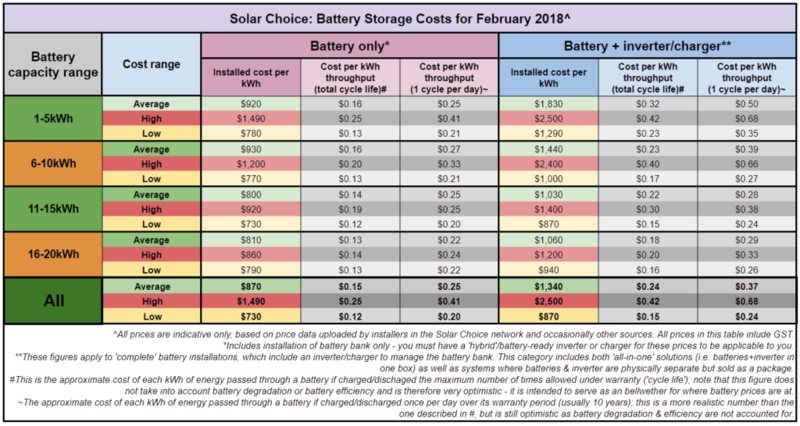 Pricing figures are based on a range of battery size offerings in four size ‘buckets’ (1-5kWh, 6-10kWh, 11-15kWh, 15-20kWh); the 3kWh, 8kWh, 13kWh and 18kWh battery capacity sizes used in the table below are the ‘middle size’ battery bank from each of these buckets, and the prices were generated by multiplying each number by the average $/kWh system sizes for each bucket (detailed in the second table in this article). We did this because it was the easiest way to give readers an idea of what they’d be looking to pay for a battery system. All the battery products use some lithium variant and have a 10 year warranty. The battery brands included this month are Alpha-ESS (various sizes) LG Chem (RESU line, various sizes), Tesla Powerwall 2 (13.2kWh), Enphase AC Battery (1.2kWh), Sungrow’s PowCube, various products in the Alpha-ESS range, and Pylontech (various sizes). Inverter brands included are Redback, Sungrow, SolaX & Goodwe. We differentiate between ‘battery only’ installations and ‘battery + inverter/charger systems’. Battery only prices apply to households that either a) already have a solar system with a battery-ready inverter installed and want to retrofit batteries to it (assuming of course, that the batteries in question are compatible with that inverter), or b) plan on having a hybrid/battery-ready inverter installed with a new solar system. Please note that not all batteries products have a ‘battery only’ equivalent – Tesla’s Powerwall 2 and Enphase’s AC Battery, for example, both have inbuilt inverters (whose cost is included alongside the battery), while LG Chem’s RESU line & Pylontech’s products are battery banks without inverters (although they do require an inverter to operate, it is possible to ‘double up’ with a hybrid inverter for your solar). You’ve already got solar: If you already have a solar system with a hybrid inverter, the ‘battery only’ price may apply to you if you find compatible batteries. If you already have solar but without a hybrid inverter, the ‘battery + inverter/charger’ pricing is probably right for you. 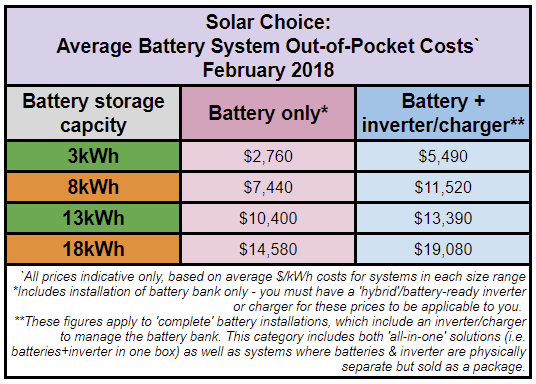 You don’t have solar yet: If you do not yet have solar, and you definitely know you want batteries, the ‘battery only’ column will only apply to you if you end up purchasing a system with a hybrid/battery-ready inverter. The battery+inverter/charger column will apply to you if you’re considering a battery product that has its own inverter (e.g. Powerwall or Enphase AC Battery) to go with your solar system. The table below is pretty information-dense, so make sure that you read the footnotes and the text below. In this table we try to take a holistic approach to representing battery value. 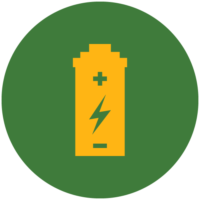 When comparing battery systems, people in the industry typically speak in terms of ‘dollars per kilowatt-hour’ ($/kWh) of storage capacity. This is an easy shortcut for discussing battery value (which is why we’ve included it), but doesn’t tell the full story as different batteries can tolerate different levels of use. For example, some batteries may only be charged/discharged (‘cycled’) once daily, while others can by cycled up to 2.7x per day (see: sonnen) without voiding the warranty. To this end, we’ve also included figures on ‘energy throughput‘. The energy throughput metric gives you an idea of how much you’ll pay for each kWh of energy that you pass through the battery over its lifespan. If you cycle it only once per day (which is the more realistic scenario since most homes will charge their batteries only with the sun and not with the grid – c.f. tariff arbitrage). As noted in the footnotes of the image above, these figures are highly indicative and are intended to serve as a means of comparison between battery products – they do not take into account battery degradation or efficiency. Despite their growing popularity, the vast majority of the almost 2 million households with solar panels in Australia do not have batteries. 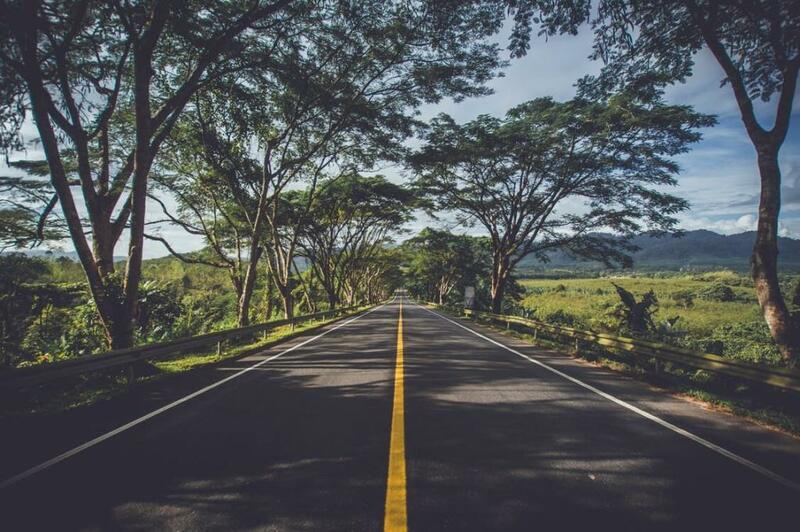 As battery technology costs fall, battery storage will become more financially attractive and the number of battery installations will increase. The ‘Are we there yet?’ Meter (the charts below) gauge the overall attractiveness of home battery storage in Australia – for both households considering a brand new solar-plus-storage system as well as those looking at a possible battery retrofit. 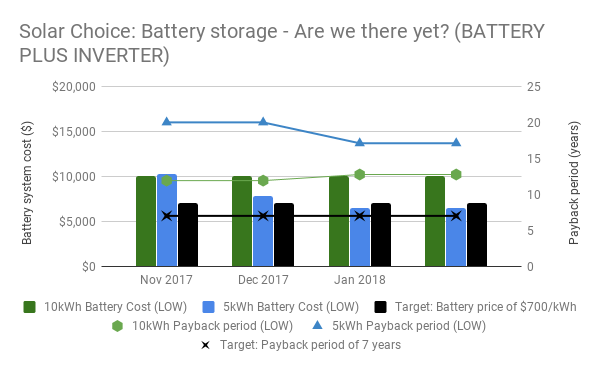 We look at the national ‘low end’ battery prices for moderately-sized (5kWh & 10kWh) battery systems (not a specific product, but more an amalgamation of various products that we’ve seen) and see how the estimated payback periods stack up against a theoretical ‘ideal’ payback period of 7 years; we see this 7 year mark as being a reasonable marker of the battery market being where it needs to be to make sense for most households (the ‘there’ in ‘are we there yet?’). We’ve also set a target $700/kWh figure for batteries (specifically lithium with a 10 year warranty) as a marker for general battery affordability. One of the biggest hurdles to battery storage uptake in Australia is the up-front costs associated with batteries. At this price point, a 10kWh battery system would cost roughly $7,000 and a 5kWh battery system would cost about $3,500 – tenable (if not negligible) amounts to pay for something that will go a long way towards minimising electricity bills and upping a home’s energy independence. Note that this is the payback period for the work that the battery does ‘shifting’ solar energy to evening use, and excludes direct solar benefits – calculated using our Solar & Battery Storage Sizing & Payback Estimator Tool. Payback periods for ‘whole’ solar+storage systems – those viewed as a single unit – will already come in at under 10 years in many places. Also note that it doesn’t take into account the fact that there’s an opportunity cost associated with putting your solar into batteries instead of earning a feed-in tariff for it – which actually makes batteries less appealing. Other assumptions: The model scenario assumes a house with a 5kW solar system and an average daily energy consumption level of 25kWh on the ‘evening peak’ consumption pattern. This hypothetical house is located in Sydney (which gets a middling amount of sunlight). We also use some average electricity prices for both flat rate & time of use tariffs, then average the payback periods between those two. So is battery storage there yet? 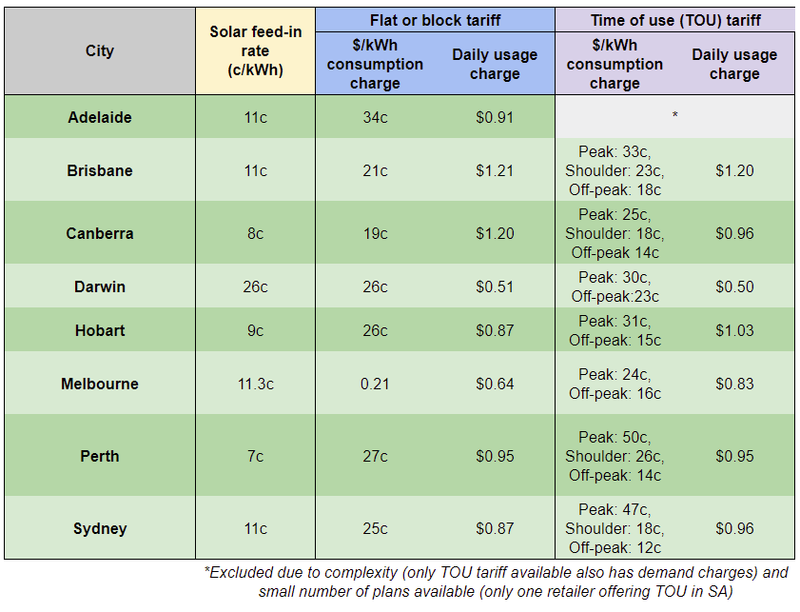 At just under $1,000/kWh for systems on the ‘low’ end of the price spectrum, and with payback periods coming in at just over 10 years in the right combinations of circumstances, we’re close enough for lots of Australians to justify making an investment in a battery retrofit, but not yet in the territory of ‘mass appeal’. Note that this month we updated the electricity price details we use in our modelling (see here), which has changed the results beyond just the battery price movements. Also remember that this chart is meant to reflect the national situation as an amalgamated whole – your individual situation (including the state you live in, the amount you pay for electricity & the deal you get on a battery system) may be conducive to a shorter payback period, so we encourage you to look into it for yourself. ‘Full’ battery-plus-inverter system installation prices vs average payback periods across two battery size categories (5kWh and 10kWh). Note that the lowest price on a 5kWh battery size category offering is already below the $7,000 affordability threshold. Click to enlarge. For anyone in the market for a brand new solar system, it may be worthwhile to tack on a small or medium-sized battery bank while you’re at it, judging by this month’s data. A 5kW solar system plus (roughly) 5kWh battery bank could cost as little as $10,000, depending on where you live and which products you go with. A system of this size at this price would enable most households to dramatically reduce their electricity bills, would deliver a reasonable return and would allow for a respectable degree of energy independence (possibly including some emergency blackout protection). ‘Battery only’ pricing vs payback periods across two battery size categories (5kWh and 10kWh). Note that payback periods are already below 10 years for two situations, while indicative installation prices are around or under the $7,000 mark for ‘low’ price 5kWh battery banks. Click to enlarge. Solar Choice’s Battery Storage Price Index is the companion to our Solar PV Price Index, which covers solar system installation prices around Australia. The aim of the Battery Storage Price Index is to assist shoppers in getting a grip on this relatively new market and assess whether batteries are worth their while. Tables and charts included in this article were compiled using data from Solar Choice’s installer network database (as well as a couple of outside sources), which contains regularly-updated pricing and product details from over 100 solar & battery installation companies across Australia. Prices do not ordinarily incorporate meter installation fees or additional costs for difficult installations.